Lakhmir Singh & Manjit Kaur kaur Solutions for Class 10 Science Chapter 4 Reflection Of Light are provided here with simple step-by-step explanations. These solutions for Reflection Of Light are extremely popular among class 10 students for Science Reflection Of Light Solutions come handy for quickly completing your homework and preparing for exams. All questions and answers from the Lakhmir Singh & Manjit Kaur kaur Book of class 10 Science Chapter 4 are provided here for you for free. You will also love the ad-free experience on Meritnation’s Lakhmir Singh & Manjit Kaur kaur Solutions. All Lakhmir Singh & Manjit Kaur kaur Solutions for class 10 Science are prepared by experts and are 100% accurate. When a ray of light falls normally (or perpendicularly) on the surface of a plane mirror, it gets reflected along the same path because the angles of incidence and reflection are both equal to zero. 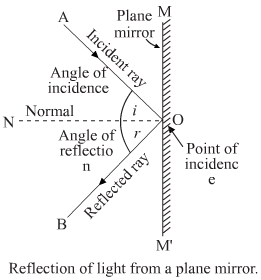 A ray of light is incident on a plane mirror at an angle of 30°. What is the angle of reflection? The angle of reflection is 30⁰ as the angle of incidence is equal to the angle of reflection, in ​accordance with the first law of reflection. The angle of reflection is 500, in accordance with the first law of reflection, which states that the angle of incidence is equal to the angle of reflection. Here, the angle of incidence = 90o - 40o = 50o( the angle of incidence is the angle between the incident ray and the normal). (a) The angle of incidence is 0o because the incident ray is parallel to the normal. (b) The angle of reflection is 0o in accordance with the first law of reflection, which states that the angle of incidence is equal to the angle of reflection. (a) in a plane mirror? (b) on a cinema screen? (a) The image formed in a plane mirror is virtual because it is formed inspite of there not being an actual meeting of the light rays. (b) The image formed on a cinema screen is real because it is formed due to an actual meeting of the light rays. 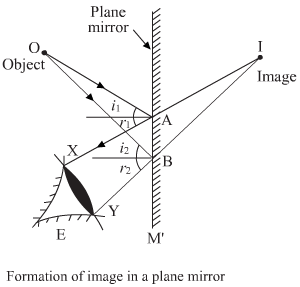 A plane mirror is required in order to obtain a virtual image of the same size as the object, as this is one of the properties of a plane mirror. Lateral inversion is the phenomenon in which the right side of an object appears to be the left side in its image in a plane mirror. The phenomenon of lateral inversion is the reason for the given effect. It will be 20 cm away from its image. This is because the distance of the plane mirror from the object is equal to its distance from the image. One property of light that makes a pencil cast a shadow when it is held in front of it is that light travels in a straight line. An image that cannot be formed on a screen is called a virtual image. When light is reflected, the angles of incidence and reflection are equal. False.We can see an object because light, on being reflected from the object, is scattered and diffused. When we look at something in a mirror, the image formed is behind it. angle of the reflected ray with the mirror surface = 90o - angle of reflection = 90o - 30o = 60o . What is the difference between a real image and a virtual image? Give one example of each type of image. 1 An image that can be projected on a screen is called a real image. An image that cannot be projected on a screen is called a virtual image. 2 The light rays actually meet at the point of image formation. The light rays do not actually meet at the point of image formation, but appear to meet there. 3 Example: the image formed on the screen in a cinema hall. 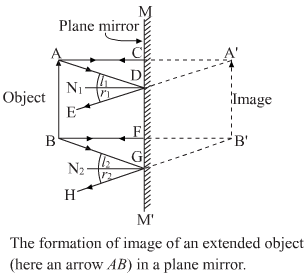 Example: the image formed by a plane mirror. (a) How would its image look like when seen in a plane mirror? (b) What is the name of the phenomenon involved? (b) The phenomenon involved is lateral inversion. When an object is placed in front of a plane mirror, the right side of the object appears as the left side in its image; and the left side of the object appears as the right side in the image. This change of sides of an object and its mirror image is called lateral inversion. For example, the right hand of a person appears as the left hand in the image formed by a plane mirror. The word ambulance would appear as when reflected in a plane mirror. It is written this way so as to help a person driving a vehicle ahead of the ambulance to read it as AMBULANCE when he/she sees the rear view mirror. This is because the rear view mirror forms a laterally inverted image. A photograph is made when a real image is projected on a photographic film. The image formed by a plane mirror is virtual and cannot be taken on a photograph. The image is smaller in size compared to the actual object. The image is the same size as the object. (a) Incident ray: The ray of light that falls on a mirror is called the incident ray. In the figure, AO is the incident ray of light. The incident ray gives the direction of the light falling on the mirror. (b) Point of incidence: The point at which the incident ray falls on a mirror is called the point of incidence. In the figure, the point O on the surface of the mirror is the point of incidence. (c) Normal: The normal is a line at right angles to the mirror surface at the point of incidence. In the figure, the line ON is the normal to the mirror surface at point O. (d) Reflected ray: The ray of light that is sent back by the mirror is called the reflected ray. In the figure, OB is the reflected ray of light. The reflected ray of light shows the direction in which the light travels after being reflected from the mirror. (e) Angle of incidence: The angle of incidence is the angle made by the incident ray with the normal at the point of incidence. 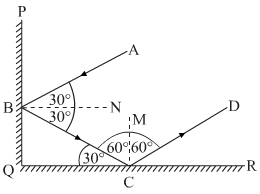 In the figure, the angle AON is the angle of incidence. The angle of incidence is denoted by the letter i. (f) Angle of reflection: The angle of reflection is the angle made by the reflected ray with the normal at the point of incidence. 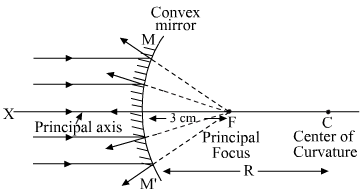 In the figure, the angle NOB is the angle of reflection. The angle of reflection is denoted by the letter r.
The angle of incidence is always equal to the angle of reflection . If the angle of incidence is i and the angle of reflection is r, then, according to the first law of reflection, ∠i =∠r . For example, if one measures the angle of reflection <NOB (in the figure), one will find that it is exactly equal to the angle of incidence <AON. The second law of reflection states that the incident ray, the reflected ray and the normal (at the point of incidence), all lie in the same plane. For example, in the figure, the incident ray AO, the reflected ray OB and the normal ON, all lie in the same plane. (b) If the angle of reflection is 47.5°, the angle of incidence will also be 47.5° in accordance with the first law of reflection, which states that the angle of reflection is always equal to the angle of incidence. The object O gives out light rays in all directions. 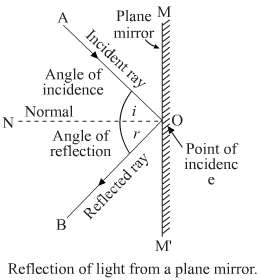 Now, a ray of light OA, coming from the object O, is incident on the plane mirror at point A. OA gets reflected in the direction AX in accordance with the law of reflection, which states that the angle of reflection r1 equals the angle of incidence i1. Another ray of light OB, coming from the object O, strikes the mirror at point B. OB gets reflected in the direction BY, thus, making the angle of reflection r2 equal to the angle of incidence i2. The two reflected rays AX and BY are divergent and cannot meet on the left side. Let's produce the reflected rays AX and BY backwards. They meet at a point I behind the mirror. 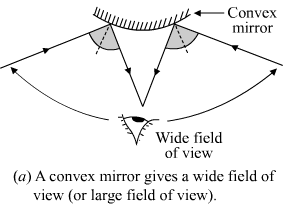 When the reflected rays AX and BY enter the eye of a person at position E, the eye sees the rays in the direction in which they enter. So, the person looking into the mirror from position E sees the reflected rays as if they are coming from the point I behind the mirror. Thus, the point I is the image of the object O formed by the plane mirror. The image produced by the plane mirror is virtual, laterally inverse and of the same size as the object. (a) Explain why, though both a plane mirror and a sheet of paper reflect light but we can see the image of our face in a plane mirror but not in a sheet of paper. (b) The image in a plane mirror is virtual and laterally inverted. What does this statement mean? (c) Write all the capital letters of the alphabet which look the same in a plane mirror. (a) This is because there occurs regular reflection from a plane mirror, which has a smooth surface. Since the particles of the smooth surface are facing one direction, a beam of parallel light rays falling on it is reflected as a beam of parallel light rays in one direction only. These rays meet when produced backwards to form a virtual image of the light source. However, in the case of a rough paper, a parallel beam of incident light is reflected in different directions (diffused reflection). So, the light rays don't meet to form an image of the object. (b) This statement implies that the image formed by a plane mirror cannot be produced on a screen. Thus, it is a virtual image. Further, in the image formed, the right side of an object appears as the left side and vice-versa. This is called lateral inversion. (c) All the capital letters of the alphabet that look the same in a plane mirror are W, X, V, A, H, M, O, I and T.
(a) Always, in accordance with the first law of reflection, which states that the angle of reflection is equal to the angle of incidence. Total angle between incident ray and reflected ray = 60o + 60o = 120o . (c) 0o, since angle of incidence = 0o . According to the first law of reflection, the angle of incidence is equal to the angle of reflection. The reason being, the image cannot be projected on a screen. The image formed by a plane mirror is virtual, behind the mirror and of the same size because it cannot be projected on a screen. (d) 9.25, since the image formed by a plane mirror is laterally inverted. (a) A wall reflects light and a mirror also reflects light. What difference is three in the way they reflect light? (b) Which type of reflection of light leads to the formation of images? 1 Light rays are reflected in all directions due to the rough surface. Light rays are reflected in one direction only due to the smooth surface. (b) Regular reflection from smooth surfaces like mirrors leads to the formation of images. In regular reflection, light is reflected in one direction only because of the smooth surface of the plane. In diffused reflection, light is reflected in all directions because of the rough surface of the plane. We cannot see anything in a dark room as there is no light present. 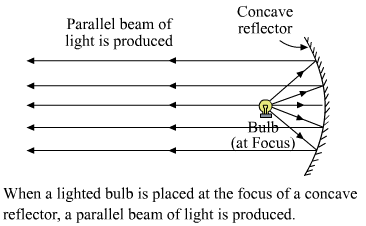 (a) We see the electric bulb because it produces light that reaches our eyes directly. (b) We see a piece of white paper due to the diffused reflection of light from the surface of the paper. (a) A boy with a mouth 5 cm wide stands 2 m away from a plane mirror. Where is his image and how wide is the image of his mouth? (b) The boy walks towards the mirror at a speed of 1 m/s. At what speed does his image approach him? (a) The image formed is 2m behind the mirror and 5 cm wide. The reason being, a plane mirror forms an image of the same size as the object, and at the same distance behind the mirror as that of the object from the mirror. the relative speed of the image will be equal to the sum of the speeds of the image and the boy. (a) An extended object in the form of an arrow pointing upward has been placed in front of a plane mirror. Draw a labelled ray-diagram to show the formation of its image. (b) State the uses of plane mirrors. Plane mirrors are used to see ourselves. Example, mirrors in a bathroom. Plane mirrors are fixed on the inner walls of certain shops ( like jewellery shops) to make them look bigger. Plane mirrors are fitted at blind turns of some busy roads so that drivers can see the vehicles coming from the other side and prevent accidents. Plane mirrors are used in periscopes. Man should walk 7.5 m towards the mirror. The reason being, the image formed by a plane mirror is the same distance behind the mirror as it is between the object and the mirror. A distance of 5m between man and his image means that the distance between him and the mirror = 52= 2.5 m.
Thus, the distance he should walk = 10 - 2.5 = 7.5 m.
Distance between original image and final image = distance the mirror moved + same distance the image moved = 2 + 2 = 4c. The image of the chart will appear 4.5 m away from the eye. The image of the chart will form at a distance of 2 m + 0.5m = 2.5 m behind the mirror. The reason being, the image formed by a plane mirror is at the same distance behind it as it is between the object and the mirror. distance of the chart's image from the eye = distance of man from the mirror + distance of image formed behind the mirror = 2 + 2.5 = 4m. Place a plane mirror in front of the message and see the image of the message. The mirror now reads as 'meet me at midnight'. The phenomenon of lateral inversion is used here. The focus of the convex mirror is situated behind the mirror, as the latter has a virtual focus. Concave mirror has a radius of curvature of 32 cm. The focal length of a convex mirror is 25 cm, i.e. 'f' is 25 cm. 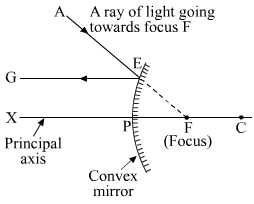 Define (a) centre of curvature (b) radius of curvature (c) pole (d) principal axis, and (e) aperture, of a spherical mirror with the help of a labelled diagram. (a) Centre of curvature (C) – It is the centre of the sphere from which the mirror is formed. (b) Radius of curvature (R) – It is the radius of the sphere from which the mirror is formed. (c) Pole (P) – Pole is the centre of the curved mirror surface, MM’. (d) Principal axis – It is the line joining P and C.
(e) Aperture – It is the effective length of the mirror, i.e. MM’. 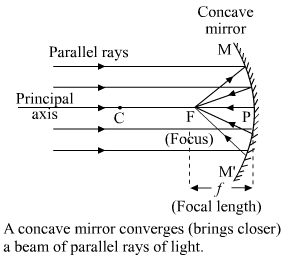 (a) Define (i) principal focus of a concave mirror, and (ii) focal length of a concave mirror. (b) Draw diagram to represent the action of a concave mirror on a beam of parallel light rays. 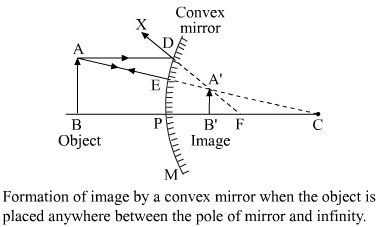 Mark on this diagram principal axis, focus F, centre of curvature C, pole P and focal length f, of the concave mirror. 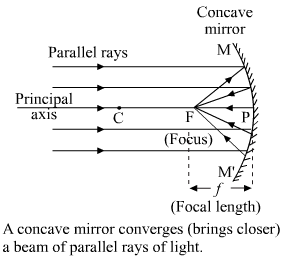 (i) Principal focus (F) of a concave mirror – Focus of a concave mirror is the point at which the incident rays, parallel to the principal axis, actually meet after reflecting from the concave mirror. 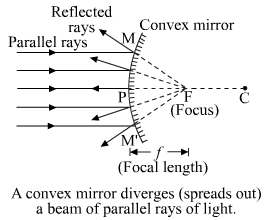 (i) Focal length (f) – Focal length of a concave mirror may be defined as the distance between its focus and pole. (a) What is meant by (i) principal focus of a convex mirror, and (ii) focal length of a convex mirror? (b) Draw diagram to show the action of convex mirror on a beam of parallel light rays. Mark on this diagram principal axis, focus F, centre of curvature C, pole P and focal length f, of the convex mirror. (i) Principal focus (F) of a convex mirror - Focus is the point at which the incident rays, parallel to the principal axis, appear to have come from, after reflection. (i)Focal length (f) - Focal length of a convex mirror may be defined as the distance between its pole and focus. In a convex spherical mirror, reflection of light takes place at the bulged-out surface. A convex mirror diverges the rays of light incident on it; hence, it acts as a diverging mirror. If R is the radius of curvature of a spherical mirror and f is its focal length, then R = 2f. The focal length of a spherical mirror is half of its radius of curvature. (b) The focal length of a concave mirror is the distance from the ......... to the mirror. (d) For a convex mirror, parallel rays of light appear to diverge from a point called the ......... .
(a) Parallel rays of light are reflected by a concave mirror to a point called the focus. (b) The focal length of a concave mirror is the distance from the focus to the mirror. (c) A concave mirror converges rays of light whereas convex mirror diverges rays of light. (d) For a convex mirror, parallel rays of light appear to diverge from a point called the focus. A communications satellite sends a parallel beam of signals down to the Earth. If these signals are to be focussed onto a small receiving aerial, then the best shape of the metal dish that can be used to collect them would be concave. The metal dish will behave like a concave mirror, which is a converging mirror. (a) What is the nature of spherical mirror? (b) Why is a hole burnt in the carbon paper? (c) At which point of the spherical mirror the carbon paper is placed? (d) What name is given to the distance between spherical mirror and carbon paper? (e) What is the advantage of using a carbon paper rather than a white paper? (a) The spherical mirror is concave. (b) A concave mirror converges light rays, and in this case it will converge the incoming parallel rays of the sun at its focus. Since the carbon paper was kept at the focus of the concave mirror, the hole was burnt into it. (c) The carbon paper was kept at the focus of the spherical mirror. (d) The distance between the mirror and the carbon paper is the focal length. A spherical mirror is a curved surface in which the inner or outer surface has the capability to reflect light. light takes place on the bulged-out surface. 2. Convex mirror has virtual focus. 3. Convex mirror diverges the rays of light incident on it. 1.In a concave mirror, reflection of light takes place on the bent surface . 2. Concave mirror has real focus. 3. Concave mirror converges the rays of light incident on it. (a) back side of a shining steel spoon? (b) front side of a shining steel spoon? When a parallel beam of light, also parallel to the principle axis, is incident on a concave mirror, it reflects from the mirror and meets at a point called the focus (F) of the concave mirror. So, a concave mirror has a real focus. Ray diagram- A concave mirror converges a parallel beam of light rays. When a parallel beam of light, also parallel to the principle axis, is incident on a convex mirror, it will reflect from the mirror, and the reflected rays will appear to come from a point which is called the focus (F) of the convex mirror. So, a convex mirror has a virtual focus. Ray diagram- A convex mirror diverges a parallel beam of light rays. When an object is placed at the centre of curvature of a concave mirror, it forms a real image of a size equal to that of the object. The object should be placed within the focus (between the pole and the focus) and in front of the concave mirror in order to obtain a virtual, erect and magnified image. When an object is placed at the focus or between the focus and centre of curvature of a concave mirror, the image produced is inverted, magnified and real. If an object is placed at the focus of a concave mirror, the image is formed at infinity. If an object is at infinity and in front of a concave mirror, the image is formed at the focus. When an object is kept beyond C, a real and diminished image is formed by a concave mirror. A concave mirror could be used as a dentist's mirror as it produces a magnified image of a tooth. A concave mirror is used in the headlights of a car. A light bulb placed at the focus of a concave mirror reflector produces a strong, parallel-sided beam of light. This is because the diverging light rays of the bulb are collected by the concave reflector and then reflected. A ray of light passing through the centre of curvature of a concave mirror gets reflected along the same path. This is because, it strikes the mirror normally or perpendicularly. A minimum of two rays are required for locating the image of an object formed by a concave mirror. When an object is placed between the focal point and the pole of a concave mirror, a virtual image is formed(as shown in the figure). The image of an object placed at the centre of curvature of a concave mirror is real, inverted and of the same size as the object. When an object is placed beyond the centre of curvature of a concave mirror, a real, inverted and diminished image of the object is formed. (b) State one use of concave mirror bases on the formation of image as in case (i) above. Here, the image A'B' of the object AB, placed between the pole and the focus of a concave mirror, is virtual and erect. Here, the image A'B' of the object AB, placed between the centre of curvature and the focus of a concave mirror, is real and inverted. (a) Give two circumstances in which a concave mirror can form a magnified image of an object placed in front of it. Illustrate your answer by drawing labelled ray diagrams for both. (b) Which one of these circumstances enables a concave mirror to be used as a shaving mirror? When an object is placed between the pole and the focus of a concave mirror, the image formed is virtual, erect and magnified, as shown in the figure. Here, the object AB is placed between the pole and the focus of a concave mirror. Its image A'B' is formed behind the mirror and is virtual, erect and magnified. When an object is placed between the centre of curvature and the focus of a concave mirror, the image formed is real, inverted and enlarged, as shown in figure 2. Here, the object AB is placed between the centre of curvature and the focus of a concave mirror. Its image A'B' is formed beyond the centre of curvature and is real, inverted and enlarged. (b) From the above mentioned cases, only case 1, where the object is placed between the pole and the focus of a concave mirror, can be used as a shaving mirror. This is because, the image formed is virtual, enlarged and erect. For an object placed between the focus and the centre of curvature, the real image formed by a concave mirror is larger than the object. The real image formed by a concave mirror is smaller than the object if the object is placed at a distance greater than the radius of curvature. The reason being, the image formed by a concave mirror is virtual, erect and magnified. The position of the object is between the pole and the focus. The reason being, the image formed by a concave mirror is real, inverted and of the same size as the object. The position of the object must then be at the centre of curvature. The reason being, the image formed by a concave mirror is real, inverted and highly diminished (much smaller than the object). Therefore, the object must be at infinity. The reason being, a ray of light passing through the centre of curvature of a concave mirror strikes the mirror normally or perpendicularly. A concave mirror is used as a torch reflector. When a light bulb is placed at the focus of a concave mirror reflector, the diverging light rays of the bulb are collected by the reflector. These rays are then reflected to produce a strong, parallel-sided beam of light. (a) For the image formed by a concave mirror to be erect and virtual, the object must be placed between the pole and the focus. (b) For the image formed by a concave mirror to be at infinity, the object must be placed at the focus. (c) For the image formed by a concave mirror to be of the same size as the object, the object must be placed at the centre of curvature. 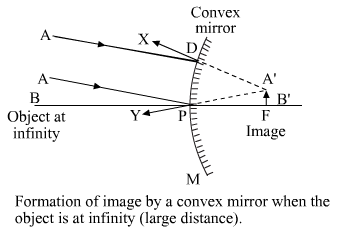 In the diagram, AB is the object and A'B' is the virtual and magnified image of AB. (a) a real image by a converging mirror. (b) a virtual image by a converging mirror. Here, P: pole, F: focus, C: centre of curvature, AB: object and A'B': image. Briefly describe how you would find the focal length of a concave mirror quickly but approximately. For an object placed at the focus, the image formed by a concave mirror is at infinity. The image is highly magnified and real. So, we will move the object at a different point and check the image size and the point of formation. The point of focus of the concave mirror will be the point where the image formed is highly magnified and at infinity. A concave mirror is used in a solar furnace. A furnace placed at the focus of a concave reflector gets heated up because the reflector focuses the sun's heat rays on it. Concave mirrors are used by dentists to see a magnified image of a tooth. The reason being, a concave mirror produces an enlarged image of an object(here, teeth) that is placed within its focus. Concave mirrors are used as shaving mirrors to view a magnified image of the face. The reason being, an enlarged image of the face is seen when it is held within the focus of a concave mirror. The reason being, an enlarged image of an object is seen when it is held within the focus of a concave mirror. When a light bulb is placed at the focus of a concave mirror reflector, the diverging light rays of the bulb are collected by the reflector and then reflected, to produce a strong, parallel-sided beam of light. When an object is placed between the pole and the focus of a concave mirror, an enlarged image is formed. The reason being, a concave mirror forms an erect image when an object is placed between the focus and the pole. Further, the radius of curvature is twice the distance between the focus and the pole. This gives a radius of curvature greater than 200mm. The object must be kept at a distance of 10 cm from the concave mirror in order to produce a virtual, erect and magnified image. The reason being, a concave mirror forms a virtual, erect and magnified image when an object is placed between the focus and the pole. A person must hold his face at a distance of 20 cm , away from the concave mirror. A concave mirror forms an erect, virtual and magnified image when an object is placed between the focus and the pole. Therefore, it acts as a shaving mirror. (i) At position (c), i.e., 20 cm from the concave mirror, the image formed will be magnified and real. The reason being, a real and magnified image is formed by the concave mirror when an object is placed between the focus and the centre of curvature. (ii) At position (d), i.e., 10 cm from the concave mirror, the image formed will be magnified and virtual. The reason being, a virtual and magnified image is formed by the concave mirror when an object is placed between the focus and the pole. (iii) At position (a), i.e., 35 cm from the concave mirror, the image formed will be diminished and real. The reason being, a diminished and real image is formed by the concave mirror when an object is placed beyond the centre of curvature. (iv) At position (b), i.e., 30 cm from the concave mirror, the image formed will be of the same size as the object. The reason being, an image of the same size as the object is formed by the concave mirror when the object is placed at the centre of curvature. (i) The sign given to the focal length of a concave mirror (according to the New Cartesian Sign Convention) is negative. This is because the focus of a concave mirror is in front of the mirror, on the left side. (ii) The sign given to the focal length of a convex mirror (according to the New Cartesian Sign Convention) is positive. The is because the focus of a convex mirror is behind the mirror, on the right side. (a) A convex mirror has a positive focal length because the focus of a convex mirror is behind the mirror and on the right side. (b) A concave mirror has a negative focal length because the focus of a concave mirror is in front of the mirror and on the left side. A mirror having a focal length of +10 cm is a convex mirror(a convex mirror has a positive focal length, ​according to the 'new cartesian sign convention'). A concave mirror can have a focal length of -20 cm. The reason being, a concave mirror has a negative focal length(​according to the 'new cartesian sign convention'). All distances are measured from the pole of a spherical mirror. (a) Height of a real image. (b) Height of a virtual image. (a) A negative sign has been given to the height of a real image. (Because a real image is formed below the principal axis, it's given a negative sign). (b) A positive sign is given to the height of a virtual image. (Because a virtual image is formed above the principal axis, it's given a positive sign). All distances are measured from the pole of the mirror as origin. Distances measured in the same direction as that of incident light are taken as positive. Distances measured against the direction of incident light are taken as negative. Distances measured upward and perpendicular to the principal axis are taken as positive. Distances measured downward and perpendicular to the principal axis are taken as negative. (d) The focal length of a concave mirror is negative and that of a convex mirror is positive. This is because the focus of a concave mirror is in front of the mirror, on the left side, and the focus of a convex mirror is behind the mirror, on the right side. (c) The image distance is always positive with the exception of one case, when the object is placed between the pole and the focus. In all other cases, the image is formed in front of the mirror and on the left side. (a) Object distance (u) for a concave or convex mirror is given a negative sign. This is because, the object is always placed to the left of the mirror. The image distance (v) for a concave mirror is given a positive sign if the image formed is behind the mirror and to the right of it. The image distance (v) for a concave mirror is given a negative sign if the image formed is in front of the mirror and to the left of it. (c) The image distance (v) for a convex mirror is always given a positive sign because the image is always formed behind the mirror and to the right of it. Size of image (h') = ? Size of the image is 2 m.
When an object is placed at a distance of 20 cm from a concave mirror of focal length 20 cm, the position of the image is at infinity. The reason being, the image formed by a concave mirror is at infinity when an object is placed at its focus. What is the nature of image formed by a concave mirror if the magnification produced by the mirror (a) +4, and (b) −2? (a) The image formed by a concave mirror, with a magnification of +4, is virtual and erect. This is because, the height of both the object and the image is above the principal axis. (b)The image formed by a concave mirror, with a magnification of -2, is real and inverted.This is because, the height of the object is above the principal axis and that of the image, below it. The ratio of the height of an image to the height of an object is known as linear magnification. The ratio of the height of an image (h') to the height of an object (h) is known as linear magnification (m). Describe the nature of image formed when the object is placed at a distance of 20 cm from a concave mirror of focal length 10 cm. Here, the negative sign means that the image is formed on the left side of the mirror. Thus, it is a real and inverted image, formed at a distance of 20 m from the mirror. (a) If the magnification has a plus sign, then the image is virtual and erect. (b) If the magnification has a minus sign, then the image is real and inverted. (a) Draw a ray diagram for the formation of image. (b) Calculate the image distance. (c) State two characteristics of the image formed. We have to find the distance of the image 'v'. Thus, the distance of the image 'v' is 20 cm. (1) It is virtual and erect. Height of the image hi = ? Thus, the image is real, inverted and small in size. We have to find the distance of the object from the mirror 'u'. Thus, the distance of the object from the mirror 'u' is −6.67 cm. We have to find the focal length of the mirror 'f'. Thus, the focal length of the concave mirror 'f' is 6 cm. We have to find the focal length of the mirror 'f' and distance of the image 'v'. Therefore, the distance of the image 'v' is 12 cm behind the mirror. Thus, the focal length of the concave mirror 'f' is 24 cm. A concave mirror is a converging mirror. We have to find the distance of the image 'v' and focal length of the mirror 'f'. Thus, the distance of the image 'v' is 80 cm. Thus, the focal length of the concave mirror is 16 cm. We have to find the distance of the image 'v' and height of the image 'hi'. Thus, the distance of the image 'v' is 54 cm. Therefore, the height of the image 'hi' is 14 cm. Thus, the image is real, inverted and large in size. (a) An object is placed just outside the principal focus of concave mirror. Draw a ray diagram to show how the image is formed, and describe its size, position and nature. (b) If the object is moved further away from the mirror, what changes are there in the position and size of the image? (c) An object is 24 cm away from a concave mirror and its image is 16 cm from the mirror. Find the focal length and radius of curvature of the mirror, and the magnification of the image. (b) The image will move towards the mirror, and its size will gradually decrease. We have to find the focal length of the mirror (f) and the magnification of the image (m). Magnification produced by a convex mirror is always less than 1. This is because the size of the image formed by a convex mirror is smaller than the object. Magnification produced by a plane mirror is equal to one. This is because the size of the image formed by a plane mirror is same as the size of the object. 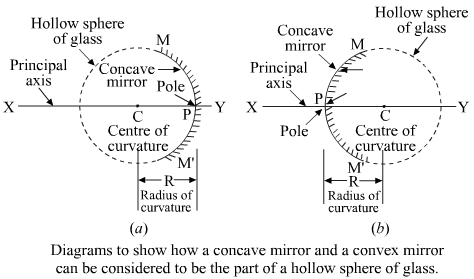 In order to obtain a magnification of −2 (minus 2) with a concave mirror, the object should be placed between the focus and the centre of curvature. A concave mirror produces a magnification of +4 when the object is placed between the focus and the pole. We have to find the distance of the image 'v' and the height of the image 'hi'. Thus, the distance of the image 'v' is 20 cm other side of cancave mirror. Therefore, the height of the image 'hi' is 6 cm. Thus, the image is virtual, erect. Therefore, distance of the image 'v' is 7.2 cm. Thus, the height of the image 'hi' is 1.6 cm. (a)We have to find the focal length of the mirror. Therefore, the distance of the image 'v' is −60 cm. Thus, the focal length of the concave mirror is 15 cm. (b) Now, if the image is virtual and 3 times magnified, then we have to find the position of the object. Thus, the object should be placed at a distance of 10 cm to get a virtual image three times the height of the object. The dentist's mirror is a concave mirror. The dentist should place the object at a distanc of 1.2 cm from the mirror. Thus, the person's image will be formed at a distance of 0.81 m from the mirror. Concave mirror is a converging mirror. 1f=1v+1u 1-15=1v+1-20 =1v-120or 1v=120-115or 1v=3-460 =160or v=-60 cm Thus, the image is at a distance of 60 cm in front of the mirror. Now, using the magnification formula, we get m=-vu=hihoor hi5=-(-60)-20or hi5=-3or hi =-3×5=-15 cmTherefore, the height of the image will be 15 cm, and the negative sign shows that the image will be formed below the principal axis. We have to find the focal length 'f' and the radius of curvature 'R'. m=-vu3=-v-10v=30 cmThus, the distance of the image 'v' is 30 cm behind the mirror.Now, using the mirror formula, we get 1f=1v+1u 1f=130+1-10or 1f=130-330=-230or 1f=-115or f=-15 cmThus, the focal length of the mirror 'f' is -15 cm.Therefore, the radius of curvature of the mirror 'R' will be 2f=2×-15 =-30 cmRadius of curvature of the mirror is 30 cm. 1f=1v+1u1-100=1v+1-300-1100=1v-1300 1v=1300-11001v=1300-11001v=-2300v=-150 mmThus, the image will be at a distance of 150 mm in front of the mirror.Now, using the magnification formula, we getm=hiho=-vuhi50=-(-150)-300=-12hi =-502=-25 mmThus, the size of the image will be 25 mm. How far should an object be placed from the pole of a converging mirror of focal length 20cm to form a real image of the size exactly 14th the size of the object? m=-vu-14=-vuv=u4Using the mirror formula, we get1f=1v+1u1-20=4u+1u-120=5uu=-100 cmThus, the object should be placed in front of the concave mirror at a distance of 100 cm. When an object is placed at a distance of 50 cm from a concave spherical mirror, the magnification produced is, -12. Where should the object be placed to get a magnification of, -15? We have to find the distance of the object when the magnification is m=-15. 1f=1-mu+1uor -350=-5-5+1uor -350=5u+1uor -350=6u u=-50×63=-100 cmThe object should be placed in front of the mirror at a distance of 100 cm to get the magnefiction of -15. We have to find the distance of the image (v). 1f=1v+1uSoor1-12=1v+1-20 1-12=1v-120or 120-112=1vor 3-560=1vor-260=1vor v=60-2 v=-30 cmThe image will be at a distace of 30 cm in front of mirror.Again,Magnification (m)=-vu m=-(-30)-20=-1.5Therefore, the image will be real, inverted and enlarged. Thus the image is real, inverted and enlarged. 1f=1v+1u 1-12=1v+1-4or 14-112=1vor 3-112=1vor 212=1v v=6 cmTherefore, distance of image (v) is 6 cm.Now, using the magnification formula, we get m=-vu m =-6-4=1.5Thus, the image is virtual and erect. We have to find the image distance (v) and the focal length of the mirror (f). Thus, the distance of the image is -20 cm. It means that the image will form 20 cm in front of the mirror. Thus, the focal length of the mirror is 4 cm. Thus, the position of the image is 30 cm behind the mirror. Therefore, the image is 2 times magnified than the object. 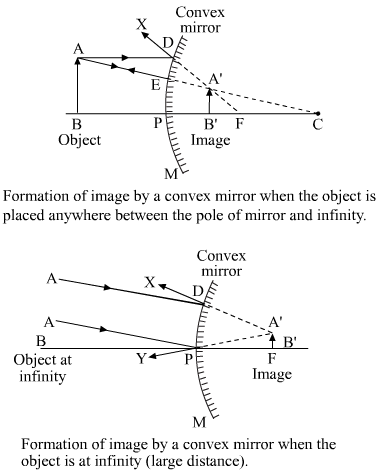 If a magnification of −1 (minus one) is to be obtained by using a converging mirror, the object needs to be placed at the centre of curvature so that an image of same size as the object can be formed. In order to obtain a magnification of −0.6 (minus 0.6) with a concave mirror, the object needs to be placed beyond the centre of curvature, as at this point a diminished image will be formed. An object is placed at a large distance but in front of a concave mirror with a radius of curvature of 40 cm. The image of this object will be formed at the focus that is 20 cm away. To obtain a magnification of -1.5, the object needs to be placed between the focus and the centre of curvature. Linear magnification (m) produced by a rear view mirror, installed in vehicles, is less than one. (a) An object, in front of a concave mirror, should be placed between the latter's centre of curvature (C) and focus (F) to obtain a magnification of −3. (b) An object, in front of a concave mirror, should be placed between the latter's focus (F) and the pole (P) to obtain a magnification of +25. (c) An object, in front of a concave mirror, should be placed beyond the latter's centre of curvature (C) to obtain a magnification of −0.4. (a) its real image is formed 20 cm from the mirror? (b) its virtual image is formed 20 cm from the mirror? Given,It is a concave mirror. f=-10 cmv=-20 cm Since the image is real and forms in front of the mirror, the equation will be1f=1v+1u 1-10=1-20+1u 1u=1-10+120 1u=-20 +10200 1u=-10200 1u=-120 u=- 20 cm Therefore, the object should be placed at a distance of 20 cm from the mirror to form a real image. Therefore, the object must be placed at a distance of 203cm from the mirror to form the virtual image. The image is real, and its magnification (m) is -2. 1f =1v+1u1-10=12u+1u1-10=12u+22u=32u u =3×(-10)2=-15 cm The object should be placed at a distance of 15 cm from the concave mirror. The image is virtual and has a magnification 'm' of 2. Thus, the object should be placed at a distance of 5 cm in front of the concave mirror. m=-vu ⇒2 =-vu⇒ v=-2u By putting the value of 'v' in the above equation, we get -2u-u =30⇒ -3u =30 u=-303=-10 cm Therefore, the object is situated at a distance of 10 cm from the lens. Hence, the mirror is at a distance of 10 cm from the object.Therefore, distance of the image 'v'=-2×-10 =20 cm(b) Using the mirror formula, we get 1f=1v+1u⇒ 1f=120+1-10 ⇒ 1f=-10200 ⇒ 1f=10-20200⇒ 1f=-120⇒ f=-20 cm Radius of the curvature R=2 f R =2×-20 R=-40 cm Thus, the radius of curvature of the lens is 40 cm. (c) Since the focal length shows a negative value, the given mirror is concave. (a) A convex mirror always forms virtual, erect and small-sized images. A convex mirror has a wider field of view because it is a diverging mirror and forms small and erect images of a large number of objects at the same time. To see an enlarged image of our face, we use a concave mirror. This is because when an object is extremely close to a concave mirror, it forms a virtual, erect and enlarged image. Whereas, in a convex mirror, the image formed is virtual, erect and smaller than the object. A convex mirror always produces a virtual, erect and diminished image of any object. When an object is placed in front of a convex mirror, the image is always formed behind the latter, and is virtual, erect and smaller than the object. Only a concave mirror can produce a real and diminished image of an object. Only a convex mirror can produce a virtual and diminished image of an object. A person should use a concave mirror to see a magnified image of any object. (a) an erect and enlarged image of an object. (b) an erect and diminished image of an object. A diverging mirror, i.e. convex mirror, is used as a rear-view mirror, as it has a wider field of view and always forms virtual, erect and small-sized images of innumerable objects at the same time. (a) as a shaving mirror? (b) as a shop security mirror? To shave the beard on our face properly and safely, we need to see an enlarged image of our face. This is why we should use a concave mirror because when an object is very close to it, a virtual, erect and enlarged image is formed. Convex mirror is used for vigilance purpose in shops because it has a wider field of view and always form virtual, erect and small-sized images of the large number of objects at the same time. A diverging mirror, i.e. convex mirror, is used as a rear-view mirror in motor cars, as it has a wider area of view, and always forms virtual, erect and small-sized images of a large number of objects at the same time. Convex mirrors are used in big shopping centres to watch the activities of the customers, as these mirrors have a wider field of view and always form virtual, erect and small-sized images of a large number of objects at the same time. A ray of light travelling towards the focus of a convex mirror becomes parallel to the principal axis after reflection on the mirror. A ray of light which is parallel to the principal axis of a convex mirror, appears to be coming from focus after reflection from the mirror. Why does a driver prefer to use a convex mirror as a rear-view mirror in a vehicle? A driver prefers to use a convex mirror as a rear-view mirror in his vehicle because this type of mirror has a wider field of view. Besides this, the convex mirror always forms virtual, erect and small sized images of the large number of objects at the same time. We cannot use a concave mirror as a rear-view mirror in vehicles because it forms an inverted image of the object which is at a large distance from it. Also, a concave mirror has an extremely small field of view, i.e. it can form very few images of many objects at the same time. (a) between infinity and pole of the mirror? The image will be virtual, magnified and behind the mirror when the object is between the infinity and focus of the mirror. The image will be virtual, diminished and behind the mirror when the object is at infinity. (a) Draw a labelled ray diagram to show the formation of image of an object by a convex mirror. Mark clearly the pole, focus and centre of curvature on the diagram. (b) What happens to the image when the object is moved away from the mirror gradually? (c) State three characteristics of the image formed by a convex mirror. (b) When the object is moved away from the mirror, the size of the image decreases. (a) Draw a labelled ray diagram to show the formation of image in a convex-mirror when the object is at infinity. Mark clearly the pole and focus of the mirror in the diagram. (b) State three characteristics of the image formed in this case. (c) Draw diagram to show how a convex mirror can be used to give a large field of view. (c) The following ray diagram shows that a convex mirror can be used to produce a large field of view. This is because when an object is in front of the convex mirror, irrespective of its distance (other than infinity), a virtual, erect and diminished image of the former is obtained. So, a convex mirror can produce image of a large number of objects at the same time. A convex mirror always forms a virtual image. It should be a convex mirror. This is because when an object is in front of a convex mirror, irrespective of its distance, a virtual, erect and diminished image of the object is obtained. A concave mirror is used by a dentist to examine the teeth of a person. Both convex and plane mirrors always form virtual images. A concave mirror cannot be used as a rear view mirror because it forms inverted images of distant objects. A concave mirror forms an image larger than the object. Aconvex mirror forms an image smaller than the object. A plane mirror forms an image similar to the size of the object. (a) What will be the focal length of this mirror? (b) Which type of spherical mirror will it provide? (c) State whether this spherical mirror will diverge or converge light rays. (a) The radius of curvature of the mirror 'R' is 50 cm. (b) Since the outer surface is shiny, it will form a convex mirror. (c) This spherical mirror will diverge the light rays. A convex mirror has a wider field of view, and always forms virtual, erect and small-sized images of a large number of objects at the same time. Size of the image formed by a plane mirror is equal to the size of the object; hence, it has a small field of view as compared to the convex mirror. Thus, a convex mirror is used as a rear view mirror in a car. (a) Convex mirror is used for vigilance purpose in big shopping centres to keep a watch on the activities of the customers, as this mirror has a wider field of view and always forms virtual, erect and small-sized images of the large number of objects at the same time. (b) Convex mirror is also used as a rear-view mirror in vehicles, as it has a wider field of view and always forms virtual, erect and small-sized images of the large number of objects at the same time. (a) In case we stand close to a large convex mirror, our image will be smaller than us. (b) In case we stand close to a large concave mirror, our image will be larger than us. Convex mirror is used as a driving mirror, staircase mirror in a double-decker bus and shop security mirror. Concave mirror is used as a shaving mirror, car headlight mirror, searchlight mirror, dentist's inspection mirror, touch mirror, make-up mirror, solar furnace mirror and satellite TV dish. 1) When an object is placed extremely close to a plane mirror, a virtual, erect and similar-sized image is obtained. 2) When an object is placed extremely close to a concave mirror, a virtual, erect and large-sized image is obtained. 3) When an object is placed extremely close to a convex mirror, a virtual, erect and small-sized image is obtained. 1. Image is of the same size as the object. 2. The distance of the image from the mirror is equal to the distance of the object from the mirror. 3. It has a small field of view. 1. Image is smaller than the object. 2. Distance of the image from the mirror is not equal to the distance of the object from the mirror. 3.Iit has a large field of view. A concave mirror forms a magnified image of an object. A concave mirror forms a real image of an object. A real image is always inverted and a virtual image is always erect. (a) Mirror B is convex, as it forms a small image. (b) Mirror A is concave, as it forms a large image. (a) The dish is collecting the large amount of signal from the satellite, and converging them to the antenna. (b) The dish should be concave. (c) The antenna should be positioned at the focus of the concave dish to receive the strongest possible signals. (d) If a larger dish was used, the aperture of the concave mirror would have been bigger; therefore, the signals received by the antenna would have been stronger. (a) the top part of the mirror is convex, as it forms virtual, erect and small-sized image. (b) the middle of the mirror is concave, as it forms virtual, erect and large-sized image. (c) the bottom of the mirror is a plane mirror, as it forms virtual, erect and image of the same size as the object. Image formed by a plane mirror is virtual, erect and of the same size as the object. Image formed by a concave mirror is virtual,erect and larger than the object. (a) Draw a diagram to represent a convex mirror. 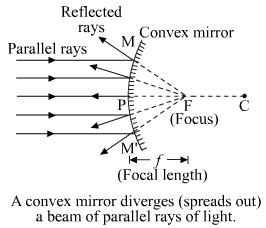 On this diagram mark principal axis, principal focus F and the centre of C if the focal length of convex mirror is 3 cm. (b) An object 1 cm tall is placed 30 cm in front of a convex mirror of focal length 20 cm. Find the size and position of the image formed by the convex mirror. The mirror is a diverging mirror, i.e. convex mirror. We have to find the position of the image 'v', height of the image 'hi' and its magnification 'm'. The image will be at a distance of 12 cm behind the mirror . Thus, the image is virtual, erect and smaller in size. Therefore, the height of the image is 0.4 cm. (a) What is the type of mirror? (b) What is the radius of curvature of the mirror? (a) It is a convex mirror, as it has a wide area of view. We have to find the position of the image (v), radius of curvature (R) and the focal length of the mirror (f). Therefore, the radius of curvature of the mirror (R) is 1.1 m.
Thus, the image is virtual, erect and small in size. (iii) Calculate the distance of the image from mirror. (2) It is smaller than the object. Focal length of the convex mirror is 5 cm. Thus, the distance of the image is 3.3 cm behind the mirror. We have to find the position of the image (v) and the nature of the image. Thus, the distance of the image (v) is 4 cm behind the mirror. Thus, the image is virtual, erect and small. Image is formed in front of the mirror at a distance (v) of -15 cm. Thus, the mirror is concave and has a focal length of 60/7. Image is formed behind the mirror at a distance (v) of 15 cm. Thus, the mirror is convex and has a focal length of 60 cm. Thus, the distance of the image 'v' is 11.1 cm behind the mirror. Therefore, the image is virtual, erect and smaller in size. Therefore, the height of the image is 1.1cm. We have to find the position of the image 'v', and its magnification 'm'. Thus, the distance of the image 'v' is 1.15 m behind the mirror. We have to find the position of the image 'v' and distance of the object from the mirror 'u'. Using the mirror formula, we get 1f=1u+1vGiven, m=12Again, m=-vuTherefore, v=-12u By putting the value of 'v' in the mirror formula, we get1f=1u-2u=-1u⇒120=-1u⇒u=-20cm⇒v=-(-20)2⇒v=10 cm If an object is placedatadistanceof20 cm in front of themirror, the image will be formed 10 cmbehindthemirror. We have to find the position of the image 'v' and its magnification 'm'. Thus, the distance of the image 'v' is 0.77 m behind the mirror. m=-vum=-0.77-3.5=14.5Positive magnification shows that the image is virtual and erect. It is a converging mirror, i.e. concave mirror. Thus the image is real, inverted and large in size. Mirror is converging mirror i.e. convex mirror. We have to find the position of the image v = ? We have to find the magnification 'm'. The mirror used here is convex, as it forms a smaller virtual image.